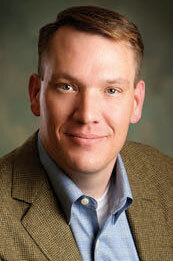 Finding the right response takes knowing current and future plans for a water system. Iron is an abundant element by mass in the earth, constituting about 80% of the inner and outer cores and approximately 5% of the crust. It is a useful metal—and soft, malleable, ductile, and strong. Its surface is usually discolored by corrosion since it combines readily with the oxygen of the air in the presence of moisture. A new pitless unit exhibiting iron build-up after a short operational life (60 days) in a fouled well system. Photo courtesy of Ned Marks of Terrane Resources Co. In our industry iron plays a vital role in casing, column pipe, screen, and pump construction. Similarly, iron plays an important role in many parts of the infrastructure of industrial nations, in water and power transmission, energy development, and construction. But in potable water supply and distribution, iron can be a troublesome component. Elevated concentrations of iron can cause discoloration and impact common treatment efforts, especially with regards to chlorination. Unfortunately, many in the water industry fail to understand the complexity of iron and the greater role it plays in well and wellfield management. The U.S. Environmental Protection Agency established National Secondary Drinking Water Regulations as nonenforceable guidelines regulating specific parameters that may cause cosmetic effects such as skin or tooth discoloration or aesthetic effects such as taste, odor, or discoloration in drinking water. States may choose to adopt them as enforceable standards. The standard for iron falls under the secondary regulations with a maximum contaminant level (MCL) of 0.3 mg/L. An MCL is the maximum allowable amount of a contaminant in drinking water delivered to the end user. Iron is present in water in two forms: either the soluble ferrous iron (Fe+2) or the insoluble ferric iron (Fe+3). exposed to air, water containing ferrous iron turns cloudy, discoloration occurs, and a reddish-brown substance begins to form. The sediment is an oxidized form of iron (FeO) that will not dissolve in water. An additional mechanism is the activity of iron-oxidizing bacteria. For example, Gallionella, a common form of iron bacteria, is found in many shallow alluvial well systems. Gallionella converts soluble ferrous iron (Fe+2), which is dissolved iron in the first stage of oxidation, to ferric iron (Fe+3) by oxidizing the dissolved iron and removing it from solution, producing an insoluble precipitate of iron oxy-hydroxide. Many will recognize this as the slimy form of iron that often feels like a wet clay and can exhibit a stalked nature more reminiscent of red seaweed. The presence of iron in a water sample is limited in its evaluation without knowing its oxidation state or its possible origin. Single tests for iron often fail to fully report the variety and types of iron present, let alone the presence and activity of iron bacteria. When it comes to iron issues, this does little to help groundwater professionals accurately diagnose the type of problem and root cause. Beyond the regulatory concerns, monitoring iron levels can aid in identifying iron-related fouling occurring within a system. The dissolved iron test analyzes for ferrous iron. Typically, groundwater wells exhibit dissolved iron (Fe+2) levels below the detection level of 0.02 mg/L. The total iron test is reported as iron (Fe) and represents both ferrous and ferric iron for a measure of the total iron in a sample. Total iron levels above 1 mg/L in groundwater samples can be an indicator that iron precipitation is occurring. In addition to evaluating dissolved and total iron, it is strongly advised wells be evaluated for iron bacteria. In a survey of potable wells suspected of fouling and evaluated in our lab over the past decade, approximately 46% contained iron bacteria. Iron-oxidizing bacteria are naturally occurring bacteria found in a variety of soil and aquatic environments, including aquifer systems. Well established populations of iron-oxidizing bacteria are often responsible for accumulations of iron in wells and piping systems and can impact pump operation, well production, and produced water quality. The standard and most reliable method for identification of iron bacteria is microscopic examination, but some labs offer bio-reactivity testing, a method best suited for field confirmation when needed. In addition to running the different types of iron tests, it is advisable to collect multiple samples for testing to learn more about what is occurring downhole. Samples collected at start-up, representing conditions within the casing when the well is idle, can aid in identifying active corrosion as well as the activity of iron-oxidizing bacteria. Samples collected while the well is actively pumping can aid in identifying background iron levels but may not represent the level of iron-related fouling occurring. Why Is the Iron Occurring? 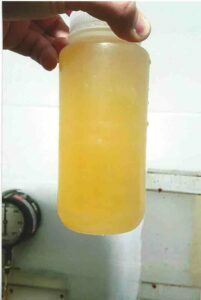 Potable well sample collected at start-up exhibiting discoloration from elevated levels of iron and iron bacteria. As mentioned at the beginning, iron is an abundant element within our earth’s composition and is commonly found in aquifer systems. While some aquifers exhibit elevated levels of iron, the occurrence of more problematic levels of iron is often the result of active corrosion. Corrosion—whether the result of aggressive groundwater chemistry, materials selection, microbial activity, or physical impaction—is more responsible for iron problems in wells than the local geology. Typically, test well samples are collected prior to final selection of the well site and well design. These samples should rule out excessive background iron from the aquifer and provide groundwater professionals a unique opportunity to evaluate the corrosivity of the water. Without going into a more exhaustive study on corrosion, a few of the important parameters to request for evaluation of corrosive conditions include: pH, conductivity, chloride levels, oxidation reduction potential, and the calculation of the Langelier Saturation Index and the Ryznar Stability Index. The Langelier Saturation Index (LSI) is a means of evaluating the potential for carbonate scale development and likelihood of corrosion in a given water sample. Positive values indicate an increased potential for the development of mineral scale, predominantly calcium carbonate. Negative LSI values are more indicative of corrosive conditions and a decreased potential for scale development. The Ryznar Stability Index (RSI) is used in conjunction with the LSI value to improve accuracy in the prediction of corrosive tendencies. RSI values within the range of 4–7 indicate the potential for scale development. RSI values in excess of 7 reflect an increased potential for corrosion to occur. RSI values closer to 9 reflect heavy corrosion. column pipe. Photos courtesy Water Systems Engineering Inc. Aggressive water chemistry is not an issue impacting only the screen or the pump; the role it plays on the well and the operational lifespan of the well is significant, and as such, should guide selection of all well components. If testing identifies corrosive conditions, consideration should be made for the selection and use of less reactive materials such as PVC or stainless steel; and the use of low-carbon steel or galvanized metals should be avoided. In addition, regardless of the test results, it is advised wells be constructed with like materials or outfitted with dielectric couplers or similar devices to limit the potential for galvanic corrosion occurring from the use of dissimilar materials. 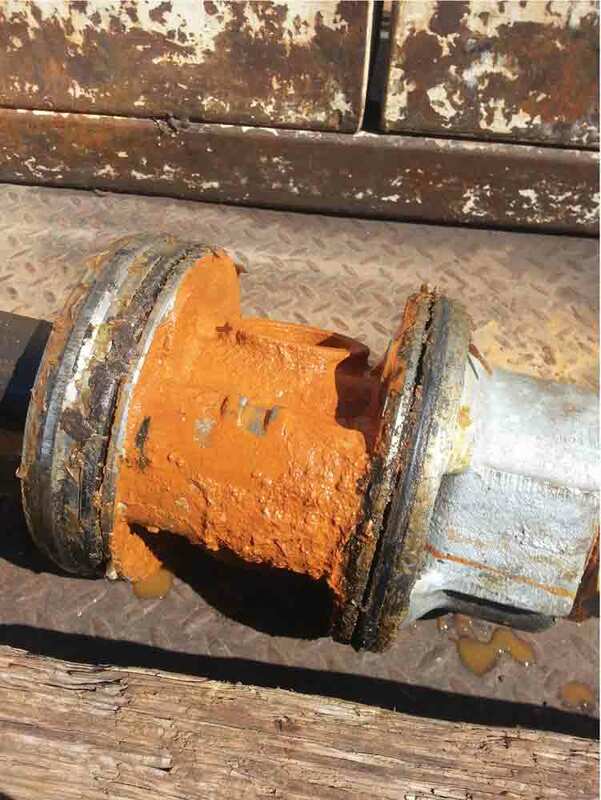 Microbiologically influenced corrosion (MIC) is often an issue developing over time in a well system and is more a factor of poor care and maintenance than design. Limiting low-flow areas or basements can aid in improving conditions. Additionally, during the construction phase, proper development and final disinfection can aid in limiting the potential for these issues. In addition to iron bacteria as noted earlier, MIC can result from high levels of anaerobic growth, the presence of sulfate-reducing bacteria, high total microbial populations, and the presence of slime-forming bacteria. Impacts related to operation, maintenance, and the site in general can also be responsible for corrosion. Excessive sanding, acidization, and physical damage can all help to expose reactive surfaces on iron components as well as to mobilize available iron within the well. 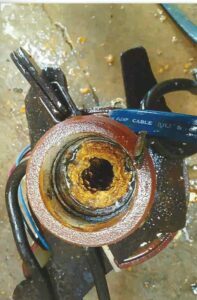 Stray current, an often overlooked means of corrosion, can impact many sites in industrial settings. failure. Routine testing of iron parameters can help identify the development of fouling prior to failure, allowing more flexibility in the response. As the iron oxide builds up within wells and piping systems, often in layers, it becomes more difficult to dislodge. Similarly, when entrained in biomass or mobilized in conjunction with iron bacteria, the iron oxy-hydroxide can be difficult to address. 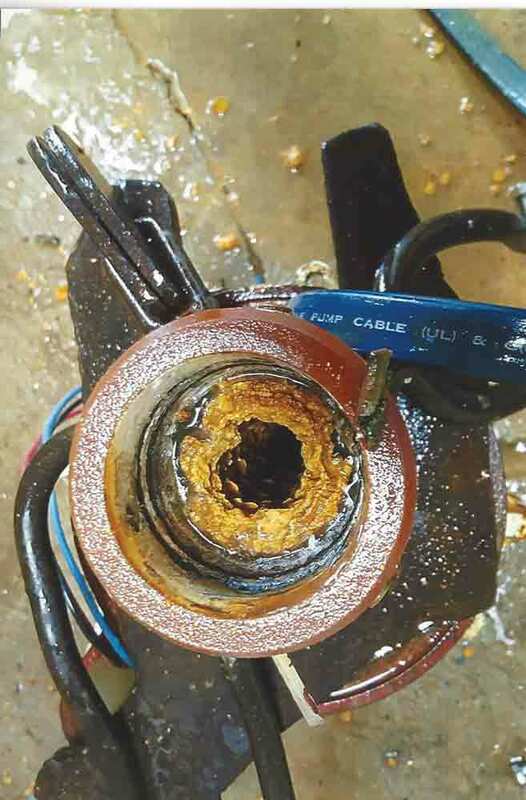 Historically, our industry has responded to this type of fouling with high doses of acid and aggressive mechanical efforts—it is more advisable to take a cautious approach. When iron fouling is recognized, it is best to first identify why it is occurring and design the treatment response accordingly. Downhole corrosion can impact the structural integrity of the well and an aggressive response may do more harm than good. How much corrosion is occurring here? Oftentimes, the surface can tell us a lot about what is occurring downhole. Photo courtesy of Ned Marks of Terrane Resources Co. Initial testing is advised to better understand the nature of the iron fouling and the water chemistry present. This can help to evaluate the potential for natural corrosion as well as aid in the selection of treatment chemicals if needed. A video survey of wells exhibiting iron issues is strongly recommended. This means of visual evaluation can help to identify areas of structural instability or heavier accumulations of iron bacteria. If iron deposits, either chemical or biologically derived, are identified, the use of a stiff nylon brush or rubber swab is recommended as a means of mechanical agitation. Most wire brushes are constructed with spare cable of high tensile strength and limited flexibility. These bristles, while effective at breaking back calcium carbonate scale, can counter efforts in iron problem wells. The scraping of the bristles on well steel casing can create more reactive surfaces in the metal downhole, compounding future corrosion and fouling potential. If chemical treatment is warranted, select products that target iron without developing new problems for the well. For example, hydrochloric acid is a commonly used mineral acid that is reactive against low carbon steel and stainless steel well components. The use of phosphoric acid, sulfamic acid, or oxalic acid, while slower reacting, may limit potential damage toward the well structure. Use of an acid inhibitor may be necessary to further protect the steel components. Iron chelators or dispersants may help to limit iron reprecipitation during treatment and encourage removal of the fouling mechanisms from the well. Careful selection is necessary as many iron chelation products that are NSF approved were designed for pipeline use and are not suitable for well systems. 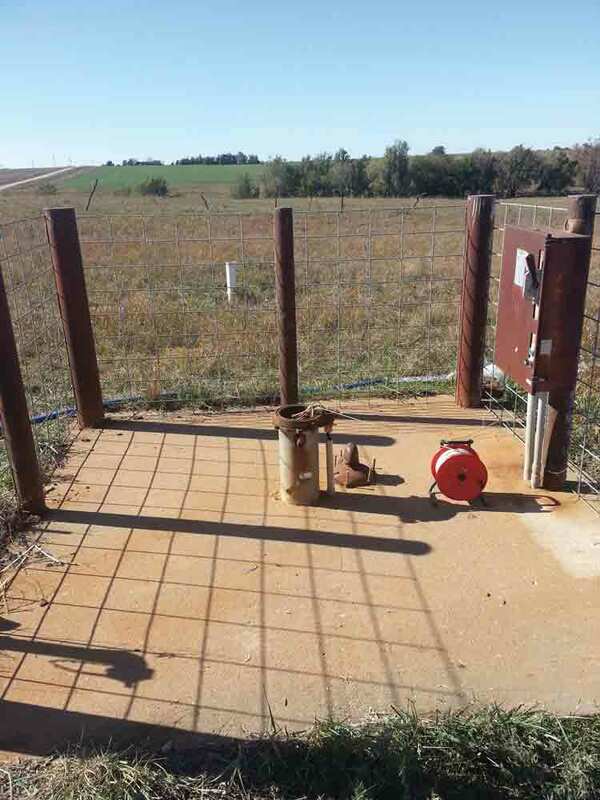 Chlorine compounds, commonly used for disinfection of new and existing wells, can be impacted by elevated levels of iron and as a result may require continued monitoring of the chlorine concentration to ensure proper disinfection. If reconstruction or structural modification is necessary, selection of similar metals or less reactive materials is important to limit corrosive activity. While it is typically not possible to fully alleviate corrosion downhole, you can limit the effects with the right choice of materials. Iron and iron fouling are among the more common issues facing well owners and groundwater professionals. Oftentimes, short-sighted decisions made during the initial design phase result in an ongoing iron problem, challenging the owner over the life of the well system. Similarly, quick, overly aggressive rehabilitation efforts can make issues worse, adding new challenges to well use. In the evaluation of operating well systems, it is advised to take into consideration iron—in all its forms—as a fouling mechanism and as a component that governs maintenance. All too often the industry response to iron is the installation of an iron removal filter. While temporarily effective, these types of systems, whether for a home or a large municipality, are just a simple bandage to a more significant problem occurring downhole. It is important the reason for the iron issues is evaluated and incorporated into the response, even if filtration is necessary. The appropriate response should consider current and future concerns for the use of the system. Furthermore, the lessons learned should not be forgotten, and instead incorporated into new well design and operation. Duderstadt, Eric. 2018. 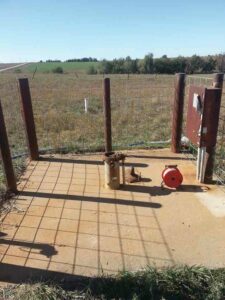 Water well corrosion: Types, effects, and resolutions. Water Well Journal 72, 12: 24-28. Hanna, Thom, John Schnieders, and Michael Schnieders. 2016. Operational Stages of the Well: Evaluating the Forms of Water Well Deterioration and Developing Corrective Actions. NGWA Press: Westerville, Ohio. 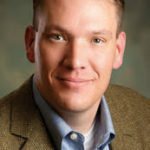 Michael Schnieders, PG, PH-GW, is a professional geologist currently serving as the principle hydrogeologist and president of Water Systems Engineering Inc. in Ottawa, Kansas. Schnieders’ primary work involves water resource investigation and management, specializing in the diagnosis and treatment of fouled well systems. Schnieders was the 2017 McEllhiney Distinguished Lecturer in Water Well Technology. He can be reached at mschnieders@h2osystems.com. To Memorize . . . or Not to Memorize?